On September 4, 1781 Governor Felipe de Neve under the authority of the Spanish King, Carlos the Third, founded El Pueblo de la Reina de Los Angeles. Eleven men, eleven women, twenty-two soldiers and one Jesuit priest christened it The Town of the Queen of Angels. Two hundred and twenty-nine years after that pivotal day people from around the world are still finding spirituality in LA. Greater Los Angeles is home to over 2,500 spiritual institutions and religions, the traditional, the new, the conservative and the unconventional. Catholic, Jewish, Baptist, Mormon, Muslim, Independent Spiritual, Methodist, Gospel of Christ, Hindu, Sikh, Buddhist, Baha'i, Pagan, New Age and Mystics flock to her nave; to pray, chant, surrender, sing, open, empty, find grace in her cosmic mix. Have you ever dreamed that Jesus did yoga? Somewhere between Protestants and Catholics you'll find Episcopalians. As part of the Anglican Church, All Saints Church has a long history of promoting social justice. Botanica San Antonio Botanicas are spiritual pharmacies for santeros, believers and the curious. Take the middle path between two store fronts and walk till you arrive at the temple. 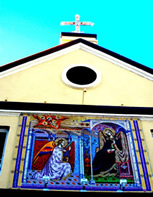 La Placita; Our Lady was founded in 1814 to serve the first settlers in Los Angeles. For many years the chapel was the only Roman Catholic Church in Los Angeles. The Buddha Essence Temple offers "Zasen" zen sitting for those finding spirituality on the cushion. Home of the annual Bach Festival. First Congregational Church houses the largest church pipe organ in the world. Finding spirituality has never sounded sweeter. International Buddhist Meditation Center Founded by scholar and author, Vietnamese Buddhist monk Venerable Dr. Thich Thein-An, the International Buddhist Meditation Center was one of the first centers to ordain western monks. New to LA? Check out the guide that makes discovering LA fun and easy. Visit LA the peaceful way.